On Monday, 20 October, the outgoing European Commission President Jose Manuel Barroso responded to English nationalists in a speech delivered at the Chatham House think tank in London. Here is the part of this speech directly countering some Europhobe arguments. That is why I do not underestimate the very real concerns UK citizens are expressing about Europe. These merit a substantive response. You don’t like the idea of a huge EU budget. I get that. By the way, it’s not – and with just 1% of Europe’s GDP we will need to fully use the agreed flexibility if we are pay our bills to those we are committed to invest in. Like Cambridge University for example, which consistently tops the tables for winning EU research funding. But it’s a shame that the political debate here focuses only on absolute figures, when quality of spending is so much more important. This Commission has reformed the budget to focus on providing funding in countries and regions for the things that really matter – investment in research, in young people, in a more connected Europe. You don’t want to be paying for armies of Eurocrats. I get that. We are cutting one in twenty staff across all EU institutions and agencies. The reforms we have introduced will save €2.7 billion by 2020 and €1.5 billion per year in the long run. Personally I support the government’s aim to get more of Britain’s best and brightest to work in our institutions. The number of British officials is less than half of what it should be and falling quickly. Constant criticism and a pending existentialist debate do not make us the most attractive employer for young British graduates. You don’t want Europe to meddle where it should not. I get that. Since 2004, the Commission has cut red tape worth €41 billion to European business. We have not interfered with the height of hairdressers’ heels, or the ergonomic design of office chairs. We have scrapped legislation on bendy cucumbers – although the supermarkets were the first to complain. We have introduced evidence-based policy-making, consultation and impact assessment as the norm. There are wide-spread concerns in the UK and elsewhere about abuse of free movement rights. I get that. Already in 2011, after constructive dialogue with the British Government, the Commission took forward changes to the way income support is dealt with under European social security rules. This benefit is now only due to those who have already worked and paid into the UK system. Since then we have undertaken concrete actions to support Member States as they apply the anti-abuse rules, for example on sham marriages. I believe that any further changes to address some of the concerns raised should not put into question this basic right, which cannot be decoupled from other single market freedoms. The Commission has always been ready to engage constructively in this discussion. But changes to these rules need all countries to agree. And it is an illusion to believe that space for dialogue can be created if the tone and substance of the arguments you put forward question the very principle at stake and offend fellow Member States. It would be an historic mistake if on these issues Britain were to continue to alienate its natural allies in Central and Eastern Europe, when you were one of the strongest advocates for their accession. [Emphases added]. Full speech available here. 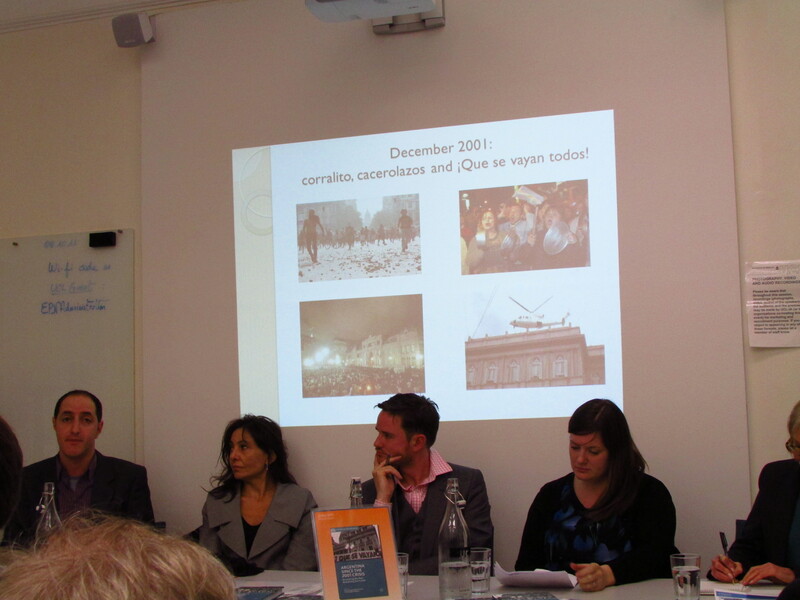 Ten days ago, the launching of a recently published book entitled Argentina Since the 2001 Crisis: Recovering the Past, Reclaiming the Future at the Institute of the Americas (University College of London) was a good opportunity to revisit the vicissitudes of contemporary politics in Argentina. The volume, edited by Cara Levey, Daniel Ozarow, and Christopher Wylde, gathers the contributions of a multidisciplinary international group of scholars to the analysis of the legacies of the 2001 crisis. In particular, the book explores the responses to the crisis in various dimensions: economic processes, domestic politics, social mobilization, and cultural practices. As invited discussant, I noted several contributions this book is making to our understanding of the implications of such dramatic events. Among other things, I highlighted the following points and encouraged further discussion and investigation. I welcomed the introduction of the concept of “crisis intermezzo.” It might be a very helpful analytical concept in the Argentine case and probably other cases too. While transition is defined as “a process during which the previous act is terminated and replaced by a different one, (…) intermezzo is a bracketed act between two acts of the same piece” (p. 144). This conceptual contrast may broaden our historical perspective of what happened in Argentina. In the light of recent developments, it is evident that Argentines have started to anticipate, once again, a new crisis as if they have developed, through recurrent crises, a particular ability to do so and the aftermath of the crisis was just an intermezzo to catch their breath. A number of things happened during the intermezzo, though. Several chapters in this volume give us tools to analyze both rebellion from below and reconstruction from above. The contributors ably illustrate how citizens mobilized driven by anger and hope, and how the state de-mobilize them and used the opportunity to give the Kirchners’ model its identity, narrative, and historical projection. I note that integrating the two process seems to be a pending task. 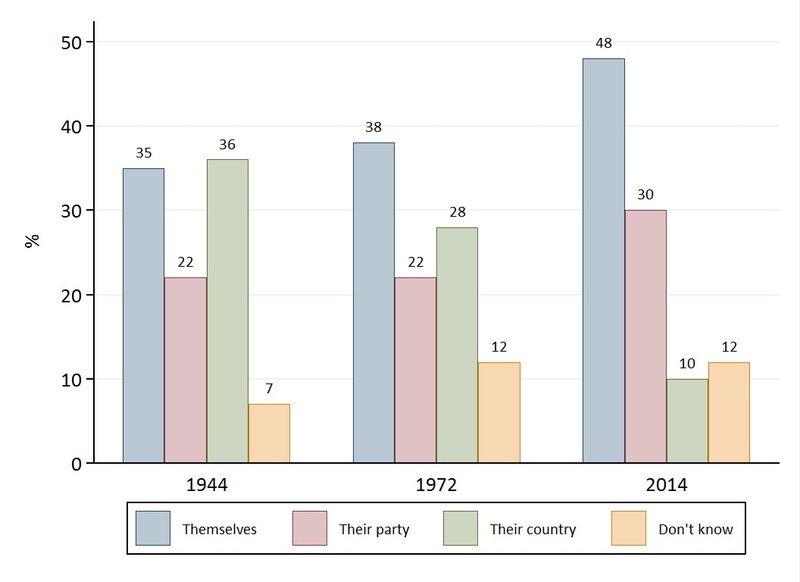 Doing so might require exploring how crises and intermezzos have become naturalised throughout their cyclical recurrence and how Argentine politics (and Peronist politics in particular) have become the art of managing crisis or using intermezzos to re-invent the (now) dominant party. With respect to the top-down part of that process, I note that there is an underlying theme in the book: the recasting of state power as post-neoliberalism promised to bring the state back in and mend the damage made by neoliberal policies. In my view, the return of the state seems to be an unfinished, inconsistent, and uneven process across geographies of the national territory and across policy areas; it has also been closely intertwined with the government’s significant efforts to re-write a narrative of the past, present and future of the country (and the role of the Kirchner family in it). This recurrent theme made me think that an emphasis on responses to the crisis might be insufficient. Most chapters, indeed, identify contradictions and tensions between national popular discourses and the policies and politics of dispossession. This suggests the need to elaborate not only on the responses but also on the non-responses, the issues that have been silenced, the mobilization that was de-mobilized, the dissent that was diluted or simply postponed. Doing so might help make sense of the paradox that the protesters’ slogan “que se vayan todos!” (they all must go!) faded in front of politicians’ resilience and resistance to leave and to implement necessary political reforms. Old and new factions continue struggling today as the time of election approaches, while popular discontent persists and focuses on recurrent problems (e.g., corruption, insecurity, inflation) and the component of hope contained in the 2001 protests has not been fulfilled yet. 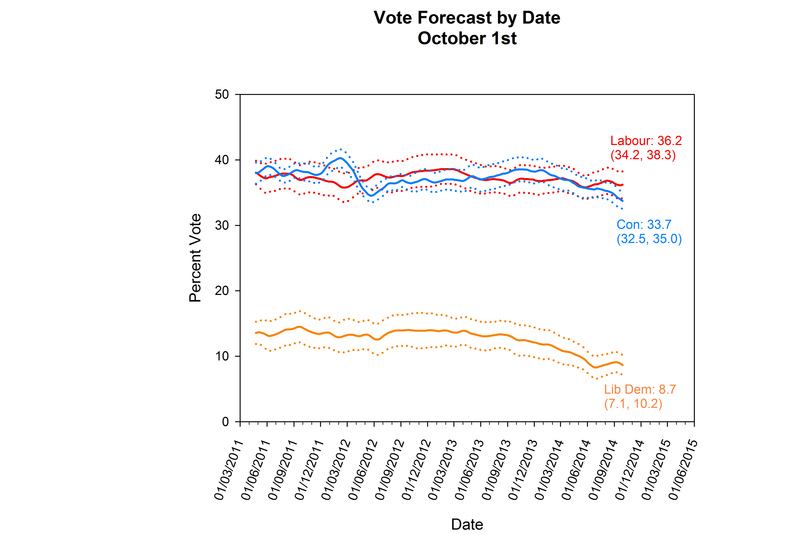 The Polling Observatory Forecast #5: Conservatives fading away? This month’s Polling Observatory reported largely stable electoral preferences during September, despite a turbulent month at the summit of politics. The shares for Labour, the Liberal Democrats and especially the Conservatives declined slightly, the latter by 1.1%. UKIP was the beneficiary, and gained 1.2%, almost exactly what the Conservatives lost. The forecast based on these numbers yet again finds the two major parties locked in a statistical dead heat but with the Conservatives slipping back further, down 1.2% to 33.7%. The gap between the parties widened a little less as our Labour forecast also fell slightly, and now stands at 2.5%. The inability of the Conservatives to close the gap in voter preferences makes it less and less likely that they can overtake Labour. Our forecast share for them has declined steadily because they are not making the gains in the polls history suggests they ought to be at this stage. Time is running out for Cameron’s party, and unless they can produce a sustained recovery in their polling numbers our forecast will continue to decline. However, it is worth remembering that swings in the polls are possible even very late in the day, and the gap between the top two remains narrow enough for our forecast to be a statistical dead heat. All signs still point to a very close election. Things are even worse for the Liberal Democrats, whose forecast share drops again, by 0.4% to 8.7%. Should the performance continue, there surely will be consequences for the share of the seats in Parliament as well, specifics of which we are planning to provide in our next (November) post. In the meantime, we are keeping a close watch on the polls in the wake of the party conferences. Is there a lasting Conservative bounce coming after Cameron’s speech highlighting tax cuts and further reductions in the size of the state? Or will this prove fleeting, as the news agenda moves on to NHS strikes, health scares and foreign entanglements? Only time and the data it reveals will tell.